What Has Your Disability Done for You Lately? 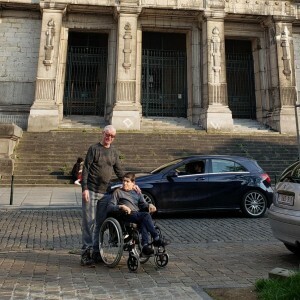 Last Sunday, I spent the day in Brussels with two friends of mine from London, father and son, named Tony and Sean. How we met is a fun story. I found them in an Irish pub in Lisbon, Portugal, and we became friends enough for me to invite them to go to a football (soccer) game on there on my birthday. Tony, the father, was hesitant, because he’d never taken his son to a game before. Sean is a young adult in a wheelchair due to his cerebral palsy. He also has an intellectual disability and other cognitive and physical issues. Sometimes, he has outbursts. More times, he smiles and loves life. As many times as possible, he’s flirting with women. He’s a sweet fun guy. Truthfully, I don’t think Tony would have agreed had he not felt sorry for me being stood up on a dinner date the night before my birthday. He agreed, though, and off we went. We had difficulties in the journey, such as about a hundred steps to get to street level from the train station and no lift (elevator). But a group of fan who were also headed to the game picked up Sean, wheelchair and all, and carried him to the top. For our return journey, a couple policemen carried him down. In the stadium, the wheelchair accessible seating is right smack dab in the middle of the rowdiest fans. This turned out to be the best thing ever. During the entire game, they were on their feet, singing, shouting, making as much raucous as they could. There was cannon fire! Sean, who’s a huge fan of live music, fireworks, and all things noisy, had the time of his life. Tony was thrilled that he could go to a football game with his son/best friend and also be able to watch and enjoy the game himself. They’ve since gone to dozens more games around the UK. Tony has raised Sean himself, as a single father, since Sean was 4 years old. You’d think this might make for a hard life, but to both of them, it’s made for an amazing life. I talk about this some in my book (Talking Splat: Communicating About Our Hidden Disabilities), what restrictions can do for us. I talk about what my fibromyalgia has done for me. My favorite analogies of what restrictions can do for us are the example of wanting to cook something but having very limited ingredients and coming up with something brilliant due to the forced creativity. There’s an entire cooking show based on a similar premise: Chopped! The other analogy is when you’re going out on a date, or even just out with a friend, and you’re broke, so you’ve got to come up with something you otherwise never would have thought to do. Because of Sean’s disabilities, he’s always been someone who needs constant stimulation. He definitely always needs to be *out*. Tony realized this when Sean was very young, so he fought to get his passport (a whole other story) and started to travel the world with him, certain this was the best way for Sean to have a full life. When I met them in Lisbon, they’d been to 25 countries. When they visited me in the US, it was their 26th. Last weekend, we were in our 4th country together. As we travel, yes, there are a lot of things we can’t do, but as we look for the things we all will like to do together, we’ve created some amazing memories together. Just on that train coming back from the Benfica soccer game, I saw one of the most beautiful things I’ve ever seen. It was a typical transit ride in a European city: filled with people who different languages, who spoke only to their friends, if at all, and who were not making eye contact with strangers. Then Sean rolled aboard and started saying “hello” to everyone around him, reaching up to shake their hands. The softening in the hearts of the people around us was palpable. That barrier that people put up around themselves just fell away, and we were suddenly all friends, all together, all part of something, and that something was humanity. My fibromyalgia has given me a greater appreciation of time, a more solid work ethic, a fierce drive to use every good moment to its fullest. My arthritis has given me a compassion for the elderly and others living with chronic pain, it’s given me compassion for people who have lost the things they used to be able to do, just as I can never run again. My irritable bowel syndrome has inspired some bangin’ recipes. What do you have in your life that you never would have had without your disability? What friendships? What memories? What superpowers? "Christina was a wonderful presenter! She is authentic, effusive, genuine and compassionate. She does an excellent job reaching out to students. I would have her back to present anytime!" Watch Christina on YouTube at www.ChristinaIreneTube.com. Christina Irene is a pleasure to work with! She is charismatic and flexible and very adaptable to times, topics, and locations, which is super important when scheduling a student activities calendar. She also has a wide range of expertise from invisible disability awareness, to creative writing workshops, to interpersonal communication, and more. She brings 110% to everything she does and truly values and appreciates the connections she makes with others as a result of her work. Every young woman needs to hear what Christina Irene has to say. As a matter of fact, it should be shouted from the rooftops for ALL to hear. Our young women need healthy, positive role models and Christina is one. She inspired me and gave me hope for every young woman out there. You are an idol to women everywhere…or should be! The positivity and insight you bring in your empowerment lectures is heartwarming and hopeful. To see a woman stand tall but not be cold or distant after facing adversity has empowered me to face my personal obstacles. Thank you and keep going! read "A Challenge to Women"